The state’s wine history dates back to the mid-19th century. The first records of grape planting in the state can be traced to 1847 in the Willamette Valley. The first actual vineyard emerged sometime during the 1850s. In 1860, census statistics showed that Oregon had produced 2,600 gallons of wine within the state using grapes from Oregon as well as California. 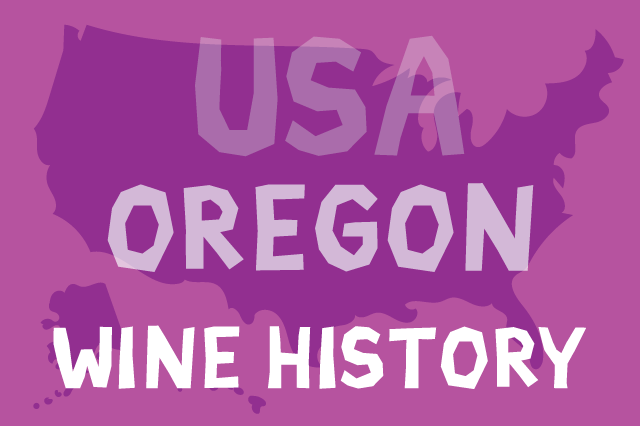 By the 1880s, a wider variety of grapes was being planted in Oregon. Sauvignon Blanc, Riesling, and Zinfandel were all being grown within the state at that time. Most of the varietals planted in Oregon were “imported” from California, which had about a century’s head start on Oregon in wine production. By 1904, there was a variety of wines being produced within the state, some of which were even winning local awards at fairs and festivals. While most areas saw the foundations of their wine making industries shaken at prohibition, it brought the wine industry in Oregon to a complete halt, and it would take decades for the state to recover. Oregon’s commercial wine industry’s major rebirth began on a wide scale during the 1960s. By 1987, Oregon had won the attention of Maison Joseph Drouhin, one of France’s most respected wineries. The company established a sister operation in the state that same year. The rationale behind that decision was that the climate conditions in Oregon were so similar to those in Burgundy that it seemed logical to dedicate some of the state’s prime acreage to planting wine grapes. The company bought 100 acres and got right to work growing Pinot Noir. The same company creates a variety of Pinot Noir wines, each with its own character and personality. Over the course of the next decade, the wine industry in Oregon continued to gain momentum and develop an international following. With its growth has also come an increasing reputation for producing great Pinot Noirs. In 2003, the Oregon Wine Board was organized to support and oversee winemaking within the state. Today, Oregon’s wine industry has become a significant part of the state economy. The biggest challenge faced by winemakers there is remaining competitive. It can often be difficult for individual winemakers to raise awareness for and recognition of their wines, and this has a direct impact on their ability to sell either to or through retailers, even within a small radius. This is, in part, why we do what we do: Keep you informed about the high-quality wines that are made in a variety of places. The quality of Oregon’s wines speaks for itself, and that, many market analysts would agree, is part of the problem. The Oregon wine industry is finally beginning to gain recognition internationally and is slowly earning a reputation as a serious player in the world of wine. Visibility and marketability remain obstacles for Oregon, making it that much more important for wine connoisseurs and enthusiasts everywhere to be aware of what the state has to offer and to lend support to their efforts.